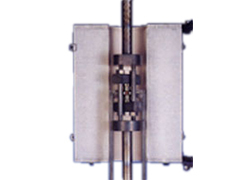 For high temperature test applications we offer furnaces for use with all dual column test stands. For high temperature test applications, we offer the TCF950, a high temperature vertical split furnace with a temperature range from 50°C to 950°C. The electrical heating elements are wound in three zones, which may be independently balanced to line arise the temperature over the full length of the furnace. The furnace is controlled by a sophisticated temperature control unit that is housed in a separate control console. Request more information to see how we can help you with a materials testing solution that suits your need.